Matt Haig is an impressive writer. His novels The Dead Fathers Club and The Possession of Mr. Cave havebeen reviewed positively in Metapsychology, as was his more recent memoir Reasons to Stay Alive. He addresses big questions in approachable ways. 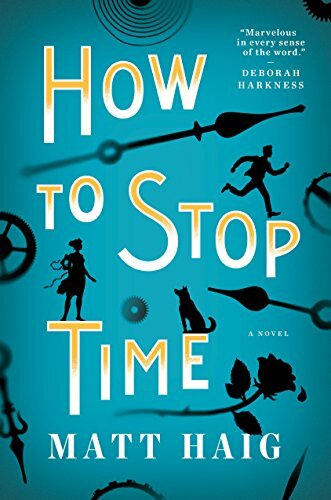 In How to Stop Time, he raises the question of whether we would want to be able to live a lot longer -- up to 1000 years, and shows some of the difficulties this would bring. The narrator of his story, Tom Hazard, was born in 1581, and he still looks like he is in his early 40s. He is resistant to disease, having lived through the Great Plague of London in 1665 and many other epidemics. But he is vulnerable to human violence, which is one of his main fears. People are hostile to those who are different, suspecting them of making bargains with supernatural forces. When he was a boy living with his mother in England, the locals accused her of witchcraft, and she was killed. From then on, Tom found that he has to move on from wherever he lives after several years because people notice that he is not aging, and they threaten him and those he associates with. So he moves from town to town, and country to country. He has lived all over the world, but he can't form attachments. Tom is not the only one who defies death. There are many people with this ability, and they have formed a group, the Albatross Society, which serves to protect them. The group is run by one of the oldest of them, Hendrich, and he advises that they move on every eight years, and that they never fall in love. Now Tom has moved back to London, and has taken up a job at a school teaching history. He is at risk of giving his secret away because he keeps on telling the students about the London of his past, mentioning details that only he knew. He is also forming a connection with one of the other teachers at the school, and is at risk of getting too close to her. So there are elements of conventional romance in the story, and there's some fun had with Tom meeting famous people. He is even a musician in Shakespeare's theatre. These elements of the novel balance the more serious themes of human intolerance, desperation and suicide. The story quickly moves around in time and place from the present to various parts of Tom's past life, and each episode is short, making the book an easy read. As with Haig's other novels, it would suit readers of many varieties, and could especially appeal to a young adult audience who enjoy engaging with life's deeper puzzles.